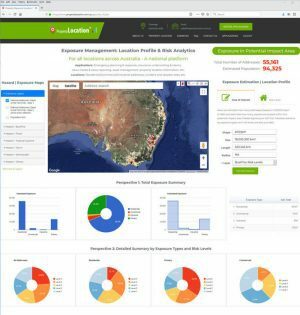 Sydney, Australia – BigData Earth has just released a new web App on location-centric exposure management specific to emergency and insurance applications. The new App combines web mapping, analysis and reporting together, and takes advantage of the cloud-based big data and analytics platforms and foundational Location Profile APIs (on property location and hazard risk information) the company has built over the past few years. The geographic coverage of the new App includes Australia and the Contiguous US. Broad-level exposure analysis: For an Area of Interest (AOI), the App can quickly calculate how many addresses and/or estimate how many people are located within potential at-risk areas (Figure 1). 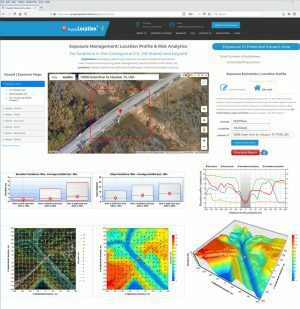 Site-level exposure analysis: For an interested site or address, the App produces a wide range of location-specific metrics on the environment and hazard exposure, including elevation, slope, surface water flow directions, vegetation, climate-warming trend, demographics, and housing. Up to 100 metrics, maps and charts are readily generated and reported in seconds (Figure 2). Customization and enhancement of the App is ongoing in response to different geographic coverage, new datasets, client’s requirements and tailored analyses.